This is my favorite way of cooking ribs, chicken, and brisket, in the summer when it's too hot to fire up the oven. I can also cook ahead and freeze meats for the winter. It sure tastes good on a blustery winter day in Oklahoma! 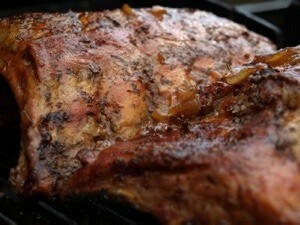 When I do babyback ribs, regular beef or pork ribs, or even chicken, brisket, or pork loin, I use my smoker/grill. It has a firebox on the side, adjustments for air intake and heat and a thermometer. You've seen the kind; looks like a black, round metal barrel with a smoke stack and separate firebox on the side. I always use hickory wood. In the firebox of my smoker I will burn 6 or 7 split pieces of hickory wood (sometimes more), until I have a good coal stand of about 5 or 6 inches (will take an hour or so to burn and add until you get about the right amount). You will have to add more wood to the fire through the cooking process. After or while making the coals, wash and trim the meat well. You can season it and allow it to marinate in the seasoning for a little while if you want to, or use a rub. I never use any seasoning on my meats, not even salt, because the hickory wood does the seasoning for you. Also remember that salt will toughen the meat. Once the meat is in the smoker, close the lid and watch the temperature gauge. You want the temperature to be at about 260 degrees F. If it doesn't get there in a reasonable amount of time, adjust the air to the firebox so the coals will get hotter. Or if it is too hot, adjust the air on the smokestack. Do the adjusting just a little bit at a time, say 1/2 inch or less. You will have to add more wood during the smoking process if you can't retain your heat degree. Using this method you don't even have to turn the meat over. It's been so long since I did babyback ribs (expensive) that I don't remember exactly how long to smoke them. A full rack of ribs usually takes a couple of hours, give or take. A large brisket will take 3 to 4 hours but time varies depending on the amount of fat marbled through the meat. Fish usually takes 30 minutes to less than an hour and flakes when it is done enough. Shrimp only takes 20 to 30 minutes and is pink when it is done. Overdone shrimp and fish are rubbery, watch carefully as some cook faster than others and are usually best left to direct grilling. Usually ribs are done when the meat has shrunk away from the end of the rib bone a little. You can also test it by poking a thick part with a meat fork and then pressing near the punctures. If the juice runs out clear then your meat is done. The safest way to check for doneness with the brisket and chicken though, is to use a meat thermometer. Poke it in the thickest part of the meat near the bone and if it reads 160 degrees F then it is done. Also, after meat is about 3/4 done, you can brush on your favorite BBQ sauce, but I've found that sometimes even this will make the meat tough. Anymore, I just offer BBQ sauce at the table because some of my family prefer just the taste of the smoked meat. Also, when there is a big meat sale, I buy and smoke meat to my heart's content. I freeze a lot of it to reheat (wrap well in heavy-duty aluminum foil) and use during the long and windy Oklahoma winter or on days that I'm just not up to cooking supper.